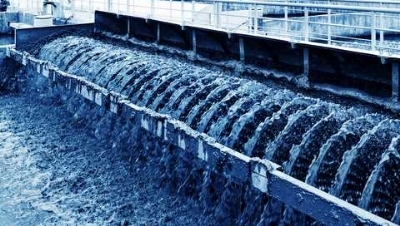 Water and wastewater companies in England and Wales recently published data on the quantities of raw sewage sludge generated at their treatment plants; it was reported that between 2016 and 2017, the sector generated 1,368,350 tonnes of dry solids (TDS) of raw sludge, equivalent to 41,279,894 tonnes of wet raw sewage sludge. 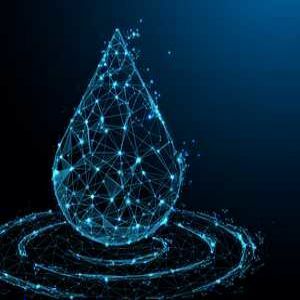 This information was made available to encourage investors, within and outside of the wastewater sector, to devise any commercial opportunities that can be created through the optimal use of this material. 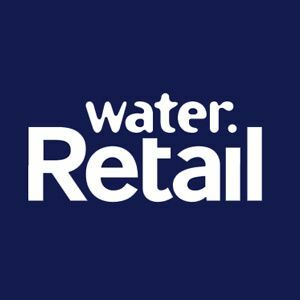 This will also help the sector to meet the objectives of Ofwat’s PR19 and Water 2020 vision. 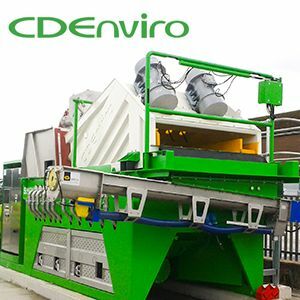 The current treatment methods of raw sewage sludge include applying physical and chemical processes to reduce the water content in preparation for the anaerobic digestion process to generate electricity. The by-product of the digestion process is a stabilised sewage sludge which is currently used as fertilisers for agricultural applications. 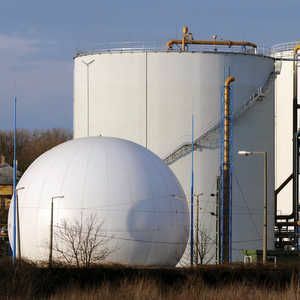 The chemical composition requirements of stabilised (treated) sewage sludge for agricultural applications focuses on the presence of nitrogen, phosphorus and organic matter, with safe levels of Potentially Toxic Elements (PTE) including chromium, zinc, copper, nickel, cadmium, lead, mercury, molybdenum, selenium, arsenic and fluoride. However, sewage sludge incorporates other valuable materials, and these are currently being wasted in the farming industry. 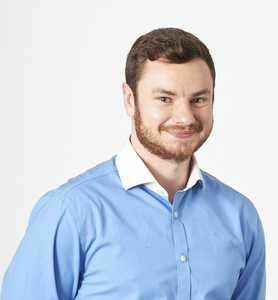 It is time for the sector to explore innovative practices and to recognise the value of raw sewage sludge as a resource rather than a waste product. 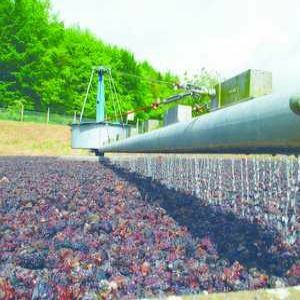 This article proposes an additional step in the treatment process of raw sewage sludge to extract existing valuable materials. These valuable materials include any substances that have high commercial value and industrial applications, such as heavy metals, noble metals and other industrial materials. 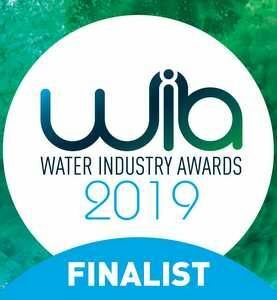 The valuable materials enter the wastewater stream from different household and industrial sources including cleaning products, cosmetics, medication, human waste, storm water, water treatment chemicals and unauthorised industrial wastewaters. 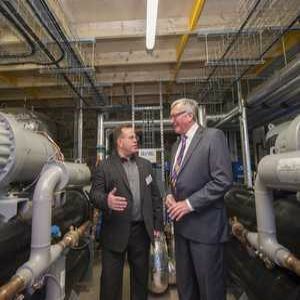 There is a potential for vast quantities of valuable materials to be extracted from sewage sludge. 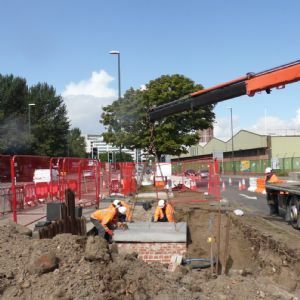 A pilot study was carried out at the University of Wolverhampton to identify and quantify precious materials in raw sewage sludge. 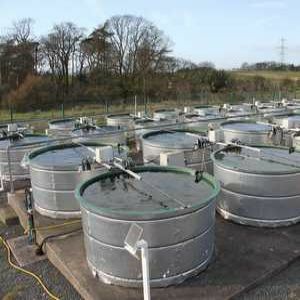 Five samples of wet raw sewage sludge were collected from a sewage treatment works in the UK between October and December 2017. The sludge samples were in the form of thick liquid that contained between 2.8 to 3.3 per cent solid content of total mass. Collected samples were filtered on 5-13μm cellulose filter paper to separate the liquid, which was later analysed for its chemical composition using Inductively Coupled Plasma mass spectrometry (ICP). Representative dry solid samples were also obtained by drying the wet raw sewage sludge for 24 hours using a water bath. The dry solid samples were dissolved in acidic solution (0.5g of dry sludge in 50ml solution) and later filtered with the same filter paper in preparation for ICP analysis. The average concentrations (5 samples) of the detected elements in the liquid and solid portions are presented in Table 1. 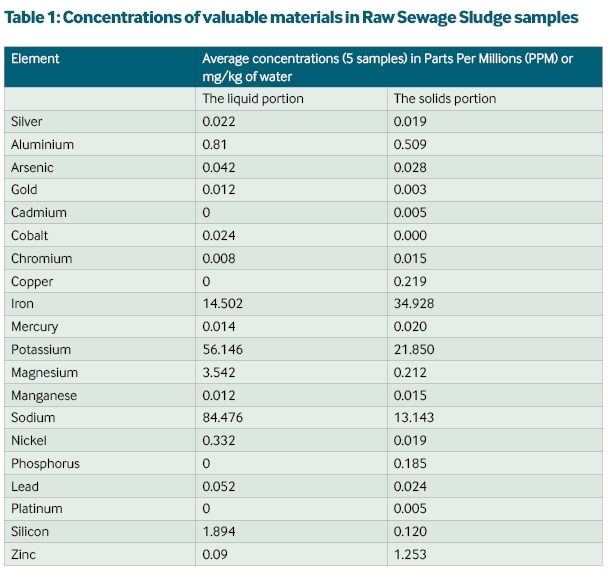 The results showed a wide spectrum of valuable materials that are present in raw sewage sludge including heavy metals (aluminium, arsenic, cobalt, chromium, iron, mercury, nickel, lead, manganese, and zinc), noble metals (silver, gold and platinum), and other elements with potential commercial value (potassium, magnesium, sodium, silicon). It is very early at this stage of the research to accurately quantify the amount of valuable materials that can be extracted. 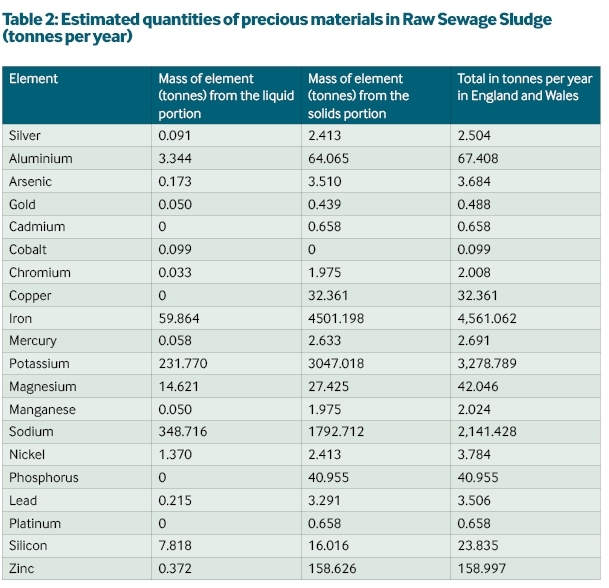 However, if we assume that all the identified elements are chemically available for full extraction, the quantities presented in Table 2 can be theoretically recovered from the sewage sludge generated in England and Wales each year. The next stage of this study is to carry out wider research to identify and quantify valuable materials on a national scale for a minimum period of 12 months. This will help the research team to understand the impact of seasons, location and demography on the chemical composition of raw sewage sludge. The data from this stage will also be used to prepare feasibility studies to assess the financial viability, practicality, efficiency and possibility of recovering identified materials. The final stage, and ultimate goal of this research, is to develop a one-point process where optimal extraction of precious materials can be obtained from sewage sludge. 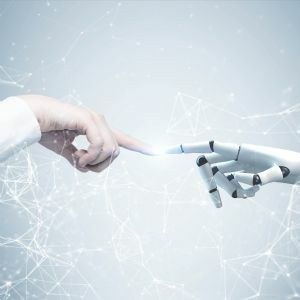 The recovery processes may include physical, chemical and biological applications and the overall cost will depend on the efficiency and complexity of each recovery method.